If you were watching the Grammy Awards earlier this year, you might remember an Oreo commercial about its new cookie dough and marshmallow crispy flavors. The ad teased the new flavors and then told viewers to tweet the hashtag #sendmeoreo to snag a free package of one of the new cookie varieties. So many users responded that Oreo ran out of cookies to give away. Chirpify’s move to TV is an extension of the action tag campaigns it’s already used for major companies in print and at live events. Chirpify has worked with brands like Adidas, Forever 21, and Lenovo to activate phrases on Twitter. How it works: A company chooses the hashtag that makes sense for its campaign, then displays the hashtag prominently in a TV commercial, as Oreo did. Chirpify helps the brand figure out what users get when they use the hashtag in a tweet. A car company might give away test drives in high-end cars, football teams might give away game tickets, and retailers might offer contests to win shopping sprees or swag. Chirpify handles the details, contacting users to collect their information. Chirpify CEO Kevin Tate pointed to Marc Jacobs’ use of hashtags to pay for perfume samples at a recent Fashion Week pop-up shop in New York as an example of how companies are exploring ways to sell or promote stuff on Twitter. “I think the commerce opportunities we’ve seen work best offer something other than things you can buy anywhere,” Tate said. “That’s not compelling enough. Early access, exclusive access, or a new experience with that product are all really valid. Action tags are particularly popular on mobile, which isn’t that surprising considering that people are refreshing Twitter and Facebook while they watch TV. Chirpify found that more than 60 percent of action tag responses are submitted from smartphones. And if you’re wondering whether the companies follow through with delivery, it seems Oreo had some pretty happy customers in the weeks after the Grammys. Tate couldn’t say which brands are lining up to use TV action tags, but given the company’s current roster of partners, we’re expecting to see cashtag campaigns from some big names. 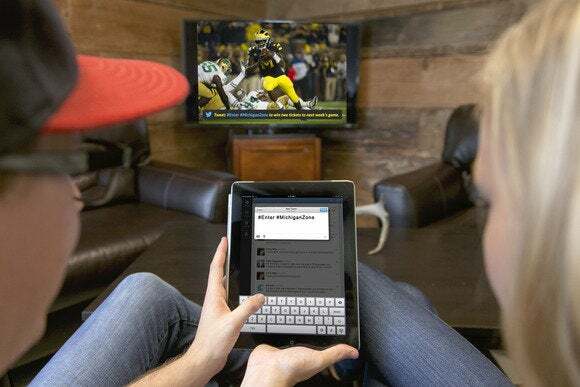 This story, "Hashtags on TV: Companies turn phrases into free stuff" was originally published by TechHive.